We said our goodbyes after breakfast and left the Collins’ around 9:30am. Dan was kind enough to drive us to the same Busan train station that they had picked us up at, though this time when we got there, the parking lot was completely full (cars were backing up the wrong way, very entertaining), so our plan for going in and having a donut and coffee together didn’t pan out. We headed in, grabbed some snacks for the nearly 3 hour train ride to Seoul Central Station, swapped our reservation for actual tickets, made sure we were in the right spot, and soon got on the train. It was a beautiful and smooth ride, much less hazy outside than when we first got to Korea. 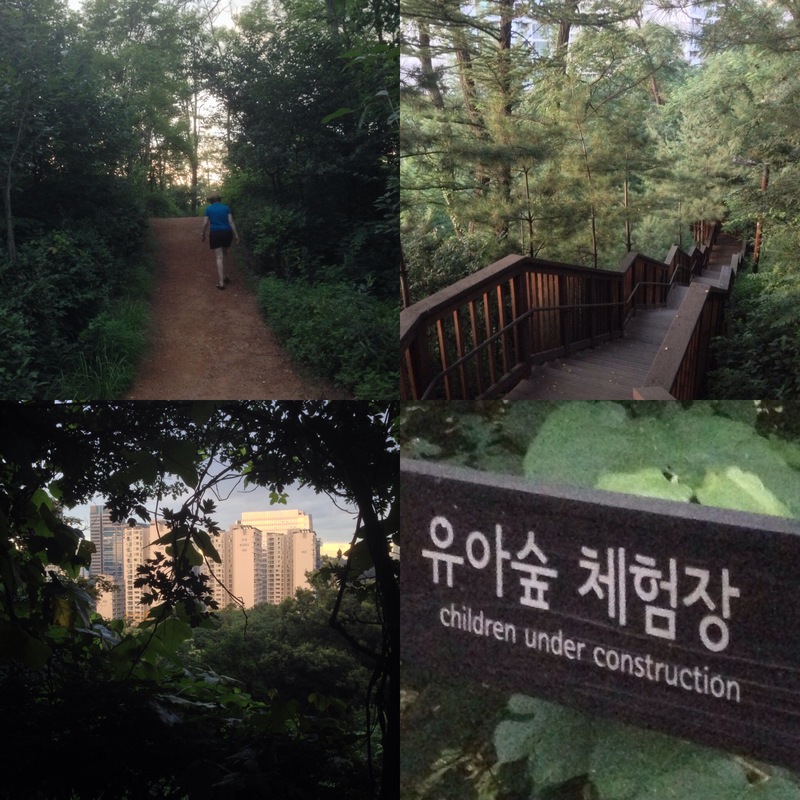 As we rode through the countryside, we tried to catch up on blogging and communicated with our Seoul Airbnb host about the best way to get to his apartment. I downloaded a bunch of apps to help with the subway and navigation, but it was quite confusing and I definitely needed help. I’ve gotten very used to using Google Maps for transit and walking directions, but it’s much less useful in South Korea. Eventually I got on the same page as our host and understood what we had to do, including the last bit of walking, but then he texted and said his father would just come and pick us up at the closest subway stop in a blue van, we just had to make sure to go out exit 9. Nine exits?? Yes – the public transportation system in Seoul is very extensive, and the stations are quite large. Luckily the exits are clearly marked so it was easy to find him. We really appreciated the pickup. A quick ride and we were at the Airbnb, which turned out to be the 6th floor (top) apartment of a building that housed a Methodist church. We knew from the description that it was run by Christians, but didn’t realize it was right above the church. Our host’s father showed us around with his limited English, and we settled in. It was tight quarters for me – track lights that were at the level of my forehead, and the bed was in a loft that I had to crawl into, but it was a really nice place. 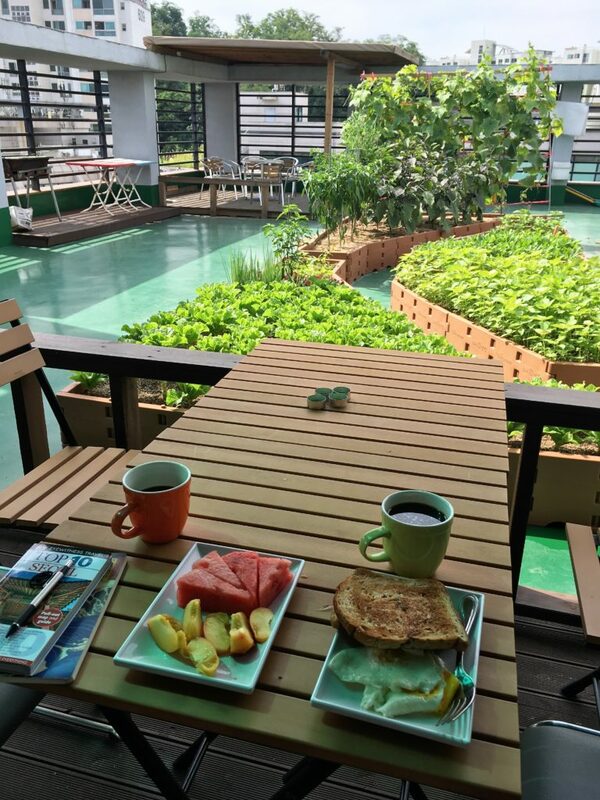 The best part was the organic garden out on the roof just outside the sliding door of the apartment, which we were invited to eat from as much as we wanted to. Eggplant, skinny green peppers (not spicy), a giant yellow cucumber, a few kinds of lettuce, kkaennip (kind of like sesame leaf), leeks, and green onions. Plenty for salads and sauteed vegetables to go with rice, which we had for a few of our meals. We explored a bit in the near vicinity of the apartment, locating a bakery and a few small grocery and convenience stores. Just past the stores was an open area running up against what looked like some hiking trails up onto a hill – Sangam Neighborhood Park. We walked up some stairs and within a few minutes were into the forest, up above the apartment buildings and noises of the city. A very beautiful park to have so close by. We were rewarded with some nice views as the sun set, then headed down to pick up groceries and back to the apartment to put together a meal with the produce from the garden. A nice peaceful end to a travel day.